You probably know by now that I am a pretty big advocate of eco-friendly living, so the fact that I have now made 5 beeswax cloths and use them regularly should not surprise you. And I honestly love using them. They are not quite as convenient as plastic wrap, nor do they have quite as many uses, but they really are very good at what they do. In fact, I have found that my food stays much fresher when I use the beeswax wrap, instead of plastic wrap. I almost exclusively use mine to store homemade bread, biscuits, rolls and almost any other bread item. I make bread all the time, so it makes sense for me to use them a lot, but you can also use them to cover left overs in the fridge, wrap cheese, fruits or vegetables and probalby lots of other things, that I haven't tried yet. They also would make a great and inexpensive gift for the friend who is seeking a minimal or eco-friendly lifestyle. And, if you aren't interested in making one, you can always buy something very similar on Amazon . Preheat your oven to 170°F. Lay out the cotton fabric on the square of cardboard. 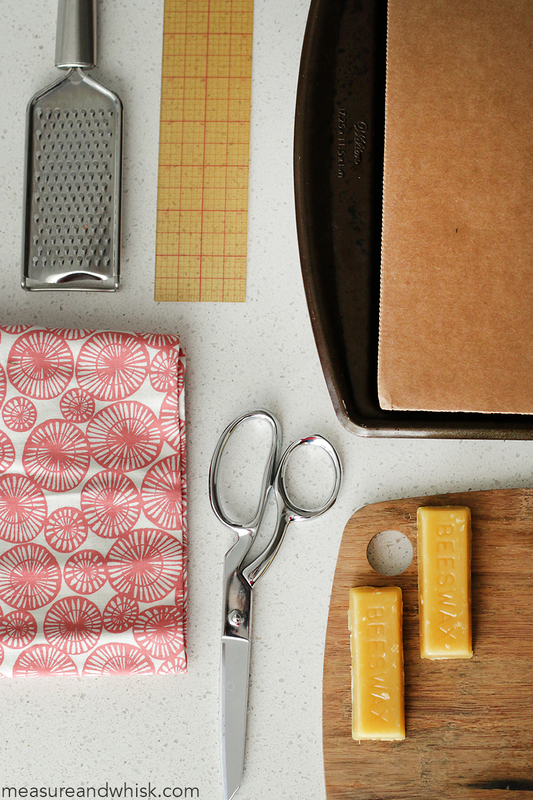 Using a cheese grater, grate the beeswax over the fabric, until it evenly covers the fabric, all the way to the edges. Separate any big clumps that form, and try to get a thin, even layer of shreds across the entire fabric. Put the cardboard in the oven, and let it 'cook' for about 5 minutes, until the beeswax begins to melt. Once the beeswax has melted about halfway (you should still see some shreds), open your oven and with a paper towel, smear the beeswax around. Push some of the soft beeswax to the edges of the fabric, and all around making sure that the entire fabric is coated in beeswax. Let it 'cook' another 3 or so minutes, the beeswax has completely melted. Remove the cardboard from the oven, and let it sit on your cold stove for about 10 minutes, to let the beeswax set. Remove the fabric from the cardboard, discard the cardboard, and fold your beeswax to store. And voilá! You are done! 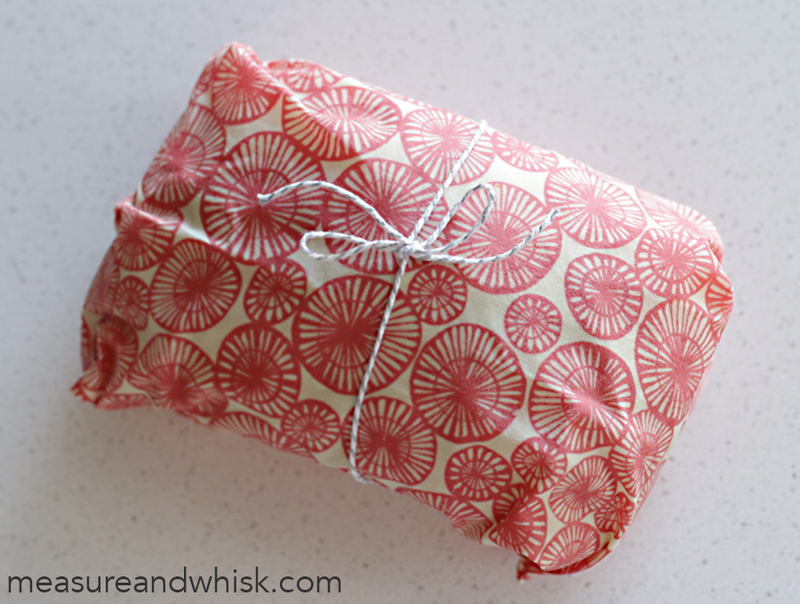 Use for wrapping and storing cheese, and bread items. 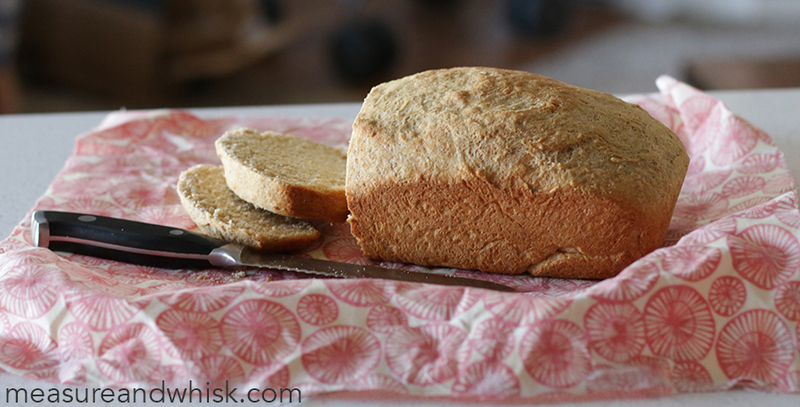 Beeswax cloth will help keep your bread soft for 2-3 days. I haven't ever stored cheese in mine, but I know you and, I have heard it works great. To clean, wash in the sink with cold water and dish soap, and let air dry. With 7 people in my family, we go through a lot of plastic! What a waste! I can't wait to make my own wax cloths for my kitchen and all of our packed lunches! Do you need to hem the fabric, or will the wax keep all the threads in place? I pinked the edges, just in case.